If you love sauerkraut watch this video for the easiest method of making it that I have seen. 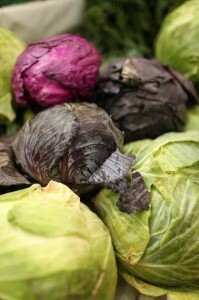 Sauerkraut is a great way to preserve cabbage and it is full of probiotics so it is very good for your gut health. It provides plenty of good bacteria and helps to prevent the bad. My favorite way of preparing it for a meal is a dish that is shown in the video, you put sauerkraut in a large pan with potatoes that I have peeled and cut into bite sized pieces and smoked sausage cut into about the same size pieces. Then I add just enough water to keep it from sticking. Put the lid on and cook over medium heat untill the potatoes are cooked. Serve it up with some bread and butter on the side and it makes a nice meal that is fairly inexpensive but very satisfying. It is also fantastic on rubens. Kitchen Gardeners International shows how to make the kraut in the video. So if you like or want to make some sauerkraut this is a very easy way to make a batch. Visit us on Facebook, Pinterest, Twitter, Google + or send an email to [email protected] to join our single daily email that contains all of that day’s articles.